If you’re truly a dog person you know that no gift is too special for your furry best friend. After all, dogs are truly members of our families, and after all the unconditional love they give us as, they deserve something special in return. Dogs don’t need the fanciest food, bed, or toys on the market. Something like this will happen more often than not, and we all know that dogs prefer your favorite shoe to a new toy, anyway! 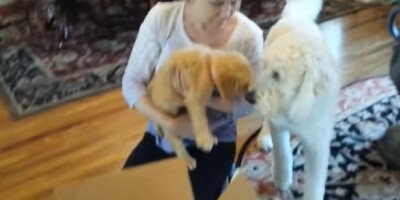 When it comes to gifts, a little love can certainly go a long way, but there’s nothing that can compare to what happens to this goldendoodle named Rhett Barkley on his birthday – his humans surprise him with a goldendoodle puppy named Scarlett! At first he doesn’t quite know what to think of this little pup, but before long, he can’t wait to play! See the adorable video of his surprise on page 2! This Cute Beagle Puppy Is Doing Her Funny Beagle Stuff! Hilarious Video: Dogs Chase Men In Squeaky Shoes!